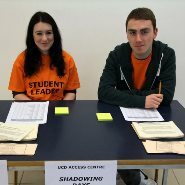 Every year selected 6th Year students take part in the UCD Access Centre Voluntary Tutoring Scheme. Once a week, students from UCD come to give grinds in Leaving Cert subjects to our students. The scheme runs for 8 weeks and is free for our students. Each grind lasts for 2 hours and the students are tutored in two subjects.